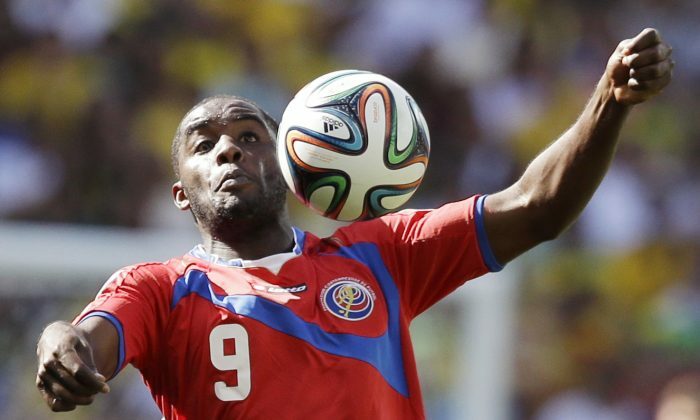 Costa Rica and Arsenal forward Joel Campbell has been having an excellent World Cup 2014 so far. The 22-year-old youngster scored a goal and provided an assist in Costa Rica’s 3-1 victory over traditional football power Uruguay in their opening match. Campbell stands at 5’10, and weighs about 157 pounds. Although he is signed with Arsenal, he has not yet played for his parent club. In the 2013-2014 season, he found himself at Olympiakos, where he made 32 appearances and scored 8 goals, including a famous effort against Manchester United in the Champions League Round of 16. Campbell is more prolific with the Costa Rica national side, where he scored 10 goals in 34 appearances. The young forward is also known for an embarrassing dive against USA’s Matt Besler in a 2013 friendly match. Campbell bumped into Besler, faked an injury, and got Besler suspended. Check out the video below (scroll to the 5 minute 40 second mark). See an AP article on Costa Rica’s World Cup 2014 round of 16 match against Greece. RIO DE JANEIRO (AP) — This World Cup just got a whole lot easier for Costa Rica. According to the rankings, anyway. Having left former champions Uruguay, Italy and England behind to sensationally win their group — one of the toughest at the World Cup — the Costa Ricans line up against their lowest-ranked opposition so far in Greece in the second round on Sunday. It surprisingly has Costa Rica finding itself the favorite for a place in the quarterfinals. That’s certainly a new situation for the small Central American country which arrived hoping to avoid finishing last in a group of supposed powerhouses and now has a chance to be in the last eight of the whole tournament. “We were the Cinderella and now we are favorites. That’s respect and we earned it,” Costa Rica defender Michael Umana said. Costa Rica came through with a succession of shocks, beating 2010 semifinalist Uruguay 3-1, stunning 2006 winner Italy 1-0 and then not having to stretch itself in a 0-0 draw with England. No one can accuse the team of having it easy and yet it’s unbeaten and hasn’t conceded a goal at the World Cup since the 24th minute of its opening game. Because of that, Greece, a former European champion, appears happy to accept the underdog role for the last 16 game at Recife’s Arena Pernambuco. “At this stage, everyone is considered an opponent who is better than us,” Greece midfielder Lazaros Christodoulopoulos said. Costa Rica’s expectations have sky-rocketed, not just because of the results but the way they earned them. It progressed from the group stage for the second time and first since 1990, doing it with panache and attacking verve and with forwards Joel Campbell and Bryan Ruiz leading from the front. Campbell, especially, has been a revelation — helped, maybe, by his loan to Greek club Olympiakos from England’s Arsenal. The striker, who turned 22 on Thursday, could play against up to four of his Athens club teammates this weekend. If Costa Rica coach Jorge Luis Pinto is honest, Greece is probably the team he would have chosen to play out of the other 15 in the knockouts. In fact, both teams could argue they’ve had a lucky draw. While Costa Rica has been flying high from the start, Greece has taken a little time to get going. The Greeks scored their first goals of the World Cup in their last group game and secured qualification at the very end via a hotly-disputed injury-time penalty from Georgios Samaras against Ivory Coast. Greece prides itself on defensive solidity and a more measured approach, but it’s a team that is completely comfortable with its style and unafraid to play to its strengths. Those tactics have worked before. Costa Rica should be aware that Greece has its own fairytale, when the team surprised everyone to win the 2004 European Championship. Veteran midfielders Giorgios Karagounis and Kostas Katsouranis were part of that triumph a decade ago and are looking for one final football memory here in Brazil. Neither country has ever gone to the World Cup quarterfinals. One of them will now.